I received a copy of this book from Family Christian in order to facilitate my review. The opinions in this post were my own and were not influenced by any other parties. The story of the Prodigal son is one of the most well known in the entire Bible. Often I think when you grow up with the Bible it’s too easy to box in your thinking about the characters in the Bible. Kyle does the best job I know of breaking me out of this “mental rut” and causing me to see the stories with fresh eyes for what they are–real people with real emotions, real lives, real problems. It shakes up mistaken thoughts we might have of the Son of God and shows us his true heart. Praying For Your Prodigal is a hope-filled, honest book that includes first-hand stories about prodigals. Each chapter begins with a personal letter from parents and grandparents of prodigals woven together with content and commentary from Kyle Idelman’s AHA. The condensed, easy-to-navigate booklet (96 pages) provides readers with helpful ideas on how families can pray for their loved ones closest to them who may be far from God. Praying For Your Prodigal offers hope to those who need it most and contains personalized prayers as well as space to journal. Chapters include ‘The Hard Way,’ ‘I Stopped Running From God,’ and ‘Facing The Truth,” among others. His writing style is very easy to relate to, open, and easy to read—much like many other amazing Christian authors of the day—names like Max Lucado, Beth Moore, and Kelly Minter come to my mind. I appreciated how he mixed in personal anecdotes with Biblical examples and gave it all in a way that was very easy to grasp but also thought provoking. It was a great book and can easily be read in one sitting. It’s broken into 10 chapters and would be perfect as a 10 day devotional. 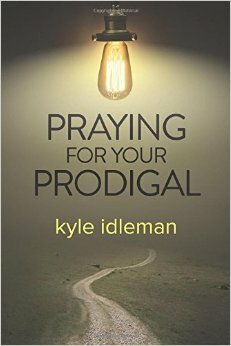 Praying For Your Prodigal was a great book and one that I will be adding to my bookshelf for keeping! If you can relate to the prodigal or even if you’re more of the “older brother” type—there is something in this book for you! « Spring cleaning 101: what do I do with all these books? This book will help so many. sometimes your heart is so heavy when you have a prodigal that you don’t even know what to pray, you feel as though you can’t even breathe. thanks for reviewing and sharing! I have a friend that would be greatly encouraged with this right now. Thanks for sharing. I recently had the chance to read this one as well, and it was fantastic! I agree, super easy to follow and relate to! This is not something I have personally experienced yet, but I love that there is this little offering of hope available to those that need it!